I've really only been using Conjure Baked Goods in my grimoire, so I'm trying some others like Force the Hand of Fate and Stretch Time. But when I did this, it got me thinking about something that I want to clarify. Although it would likely be very rare, isn't it technically possible to get a frenzy/building frenzy combo normally, then use Force the Hand of Fate to spawn a click frenzy? 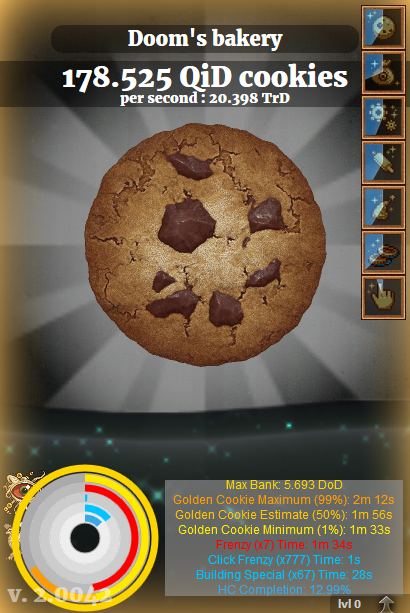 If this could be done, it would be a significant boost in cookies, right? Just wanted to know if this has ever been done before. Update: I managed to get the frenzy/building frenzy + click frenzy combo I mentioned a few times, but I just now got something at least 3 times better than that! 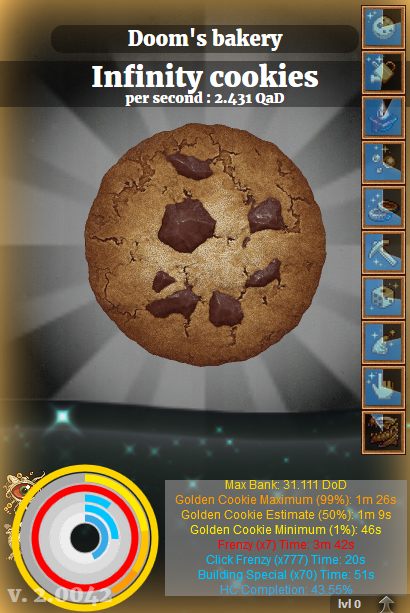 I used the spell upon getting the usual frenzy/building frenzy, but it backfired into a wrath cookie. 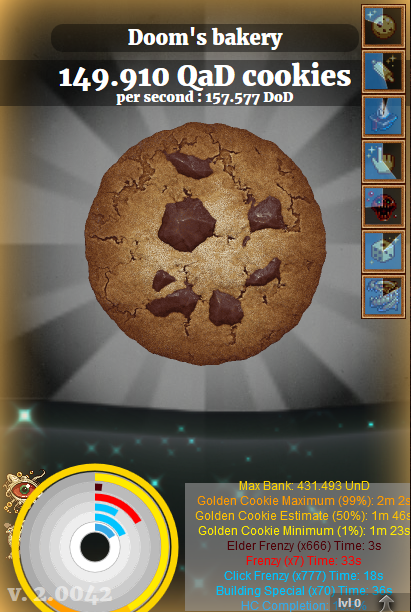 I knew I shouldn't click it, as it obviously tends to make you lose cookies, but then the unbelievable happened: it activated an elder frenzy! That triple frenzy helped an incredible amount! I believe it's only an unlucky wrath, otherwise if it backfired, it'd be easy to avoid a negative effect. Which is why it's highly skewed towards being bad instead of always being bad. True. I dug into the source code and found that, in fact, there is a small chance of getting Cursed Finger, Elder Frenzy, Sweet, or Blab off a Backfire. Because spells are seeded, it's entirely possible to map the FtHoF results on the alternative save and hunt for powerful epic game-breaking combos (burning lumps to re-fill mana). Have fun with that. And I just got a backfire, clicked it (because I dug into the code to know that it's potentially worthwhile), and got Cursed Finger on a Frenzy-Elder Frenzy. 23 seconds of clicking at 107226xCpS per click.